“We are not the number we think we are” will offer an expe­ri­ence for 36 hours non-stop, involving hun­dreds of artists, researchers and thinkers from var­ious geo­graph­ical and dis­ci­plinary back­grounds. At the heart of the pro­ject: within working spaces, focusing on hetero­ge­neous groups of people and col­lec­tives, gath­ered tem­porarily around pressing issues of our con­tem­po­rary world. They will take over mul­tiple spaces within the Cité inter­na­tionale des arts in Paris, a meeting ground open to the dia­logue between cul­tures where vis­i­tors will be invited to reflect on the pre­sent and map together path­ways for the future. The common thread of this bound­less pro­gramme is the fic­tional world of The Compass Rose (1982) a book of short sto­ries by science fic­tion writer Ursula K. Le Guin. "We are not the number we think we are" will depart from Ursula K. Le Guin’s col­lec­­tion of short sto­ries, The Compass Rose, to explore the realm of fic­­tion and create the nec­es­sary dis­­­tance from bare reality to best under­­s­tand the issues of the pre­sent time. We will try to sketch the land­s­cape of what could exist in the future by drawing some lines from these short sto­ries, which by their great variety of tones and sub­­­jects invite us to move in every direc­­tion at once. They explore fan­­tastic futures, that are imag­i­­nary, but likely, making us envi­­sion other worlds while showing us the one we know. They will script to inhabit dif­ferent real­i­ties, and build alter­­na­­tives to the way we live today. We will try to get out of our com­­fort zone, accept the unpre­­dictable, find our way through the unknown and ques­­tion again the value of evi­­dence, doubt, acci­­dent and inves­ti­­ga­­tion. The explo­ra­tion of these fic­­tional con­ti­­nents will tem­­porarily take over the Cité inter­­na­­tionale des arts. It will become the place where pro­cesses of work and devel­op­­ment of knowl­­edge will be made pal­­pable, vis­ible, audible. Over two days and one night, sci­en­tists, artists, designers, researchers in human sciences, cura­­tors, and many others will gather and get involved in the con­struc­­tion of new types of expe­ri­ences to ques­­tion our cer­­tain­ties and test hypotheses on what we believe and what we know, and allow for the emer­­gence of new forms of sit­u­ated knowl­­edge. The dia­­logue between these par­tic­i­­pants will allow us to ask our­­selves this fun­­da­­mental ques­­tion: how to invent forms which summon and rep­re­sent, which acti­­vate and mobi­lize by involving con­stel­la­­tions of players in order to imagine a desir­able future and a pro­­ject of society that emerges from our col­lec­­tive will? 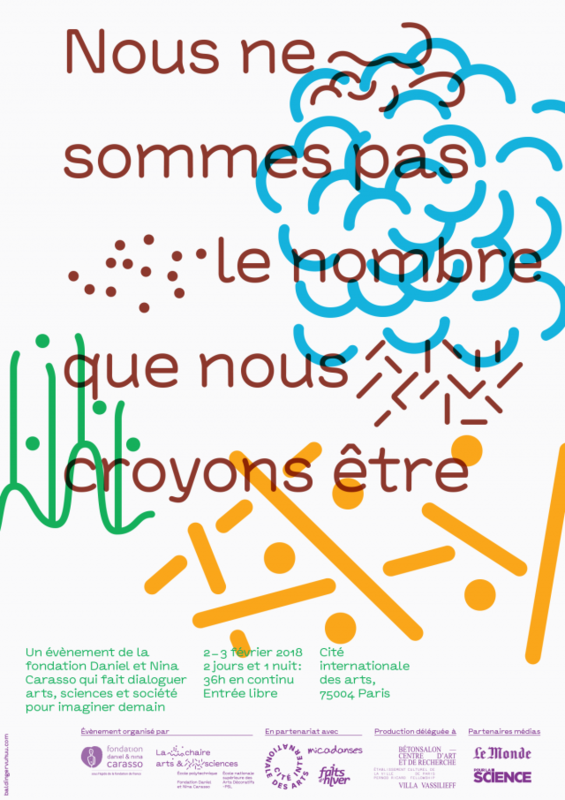 Décoratifs – PSL / Daniel & Nina Carasso Foundation and the Cité inter­na­tionale des arts. * Except for the Discontrol Party, 10pm-5:30am – 10€.